Royal College of Art student Dan Watson has designed a trawling net that filters young and endangered fish from the catch. Called SatetyNet, the design uses a combination of strategically placed holes and lighting to separate fish of different ages and species. The technique exploits behavioral and psychological differences between species of fish. Watson created the net to tackle the huge proportion of unmarketable fish caught and thrown back into the sea dead each year. The project has been nominated for the Victorinox - Time to Care competition for sustainable design. 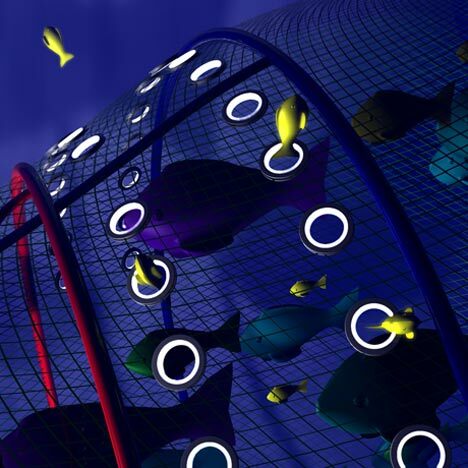 Created by Dan Watson, a student at the Royal College of Art in London, about to graduate with an MA in Innovation Design Engineering, the SafetyNet is an innovative trawling system that exploits the natural behaviour of different species and ages of fish to ensure that only marketable fish are caught. This negates the increasingly critical issue of 'unmarketable' by-catch fish that are thrown back dead into the sea, endangering both the fish themselves and the fishing industry. Every year, fishermen return over 7 million tonnes of unmarketable fish, dead, to the sea. The problem is that many current fishing techniques are not selective, leading to juvenile and endangered fish being caught along with more marketable ones. The SafetyNet is a new trawling system that cuts down on the catch and subsequent discarding of juvenile and endangered fish. By exploiting fish behavioral habits and physiology the trawl separates different species and ages of fish. Using the SafetyNet system, the fishing industry can become more sustainable. This will give security not only to the 40% of the world's population who rely on fish as their primary food source, but also to the fishermen within the industry itself.